Sow seeds thinly in a shallow, pre-watered row. Carefully sow the rocket seeds thinly along the row, spacing them out as evenly as possible. The distance between the seeds should be about 5cm.Use the edge of a hoe or a trowel to cover the seed lightly with soil. Remove any weed remnants or large stones as you go to ensure the plants have a good start.Water the seeds in well using a watering can with the rose attached. A rose is ideal as it can drench the soil but minimise disturbance to the seeds. Keep the soil moist, and be careful not to over water. 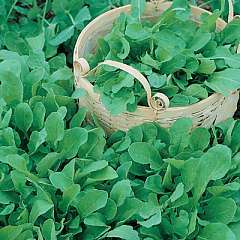 Keep nipping off the rocket leaves and it will provide rich pickings for weeks, and ensure a continual supply by making successive sowings throughout spring and summer. As autumn approaches, cover crops with sheets of horticultural fleece to keep the cold at bay, and you could be cropping right through to first frosts.